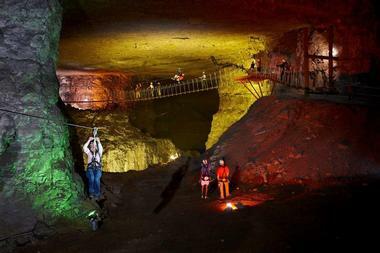 Once a working limestone mine, the Louisville Mega Cavern is now a major tourist attraction that offers tram-guided tours, a mountain bike park, and zip-line tours. Stretching beneath the Louisville Zoo and the Watterson Expressway, the Mega Cavern is classified as a building and is not only used for tourism but business, recycling, and storage as well. 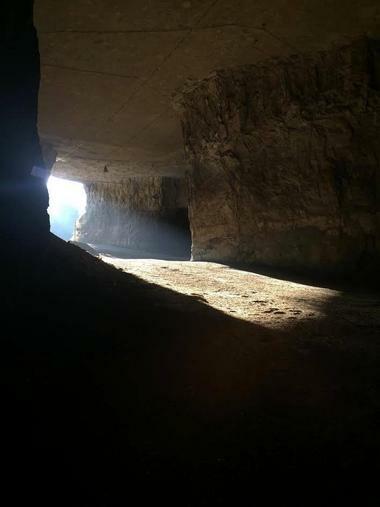 The Louisville Mega Cavern began life as a working limestone mine and quarry in the 1930s known as Louisville Crushed Stone and continued blasting rock out of the quarry until the 1970s. The cavern was used as a fallout shelter during the Cold War and was later purchased by private investors in 1989 who turned the cavern into an environmentally-conscious commercial storage facility and then a tourist attraction. Today, the Louisville Mega Cavern covers 4,000,000 square feet of space with 16 underground businesses and is considered to be the largest building and recycling center in Kentucky. 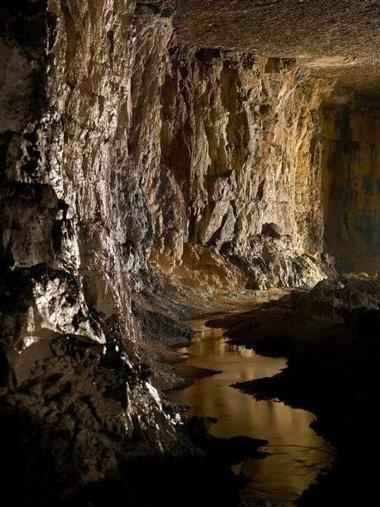 The Louisville Mega Cavern spans approximately 100 acres with over 4,000,000 square feet of space and is home to over 16 underground businesses, including storage facilities, a massive recycling plant, and several tourist attractions. The Cavern sprawls under 10 lanes of the Watterson Expressway (I-264), has four entrances and exits, the lowest of which is 25 feet above the top of the flood wall. Inside the Cavern, the average temperature is 58 degrees year round with two distinct seasons - dry in the winter and wet in the summer. Air circulates through the Cavern by natural air pressure, attempting to equal the air pressure outside, similar to that of a stove pipe on a wood stove and supplemental fans are used to control any pollution and fog might occur. The Louisville Mega Cavern is an environmentally-friendly ‘green’ building with built-in energy-saving programs such as motion sensors on the roads and warehouses to control the lights, and heat recycling from the radiant heat from rock and the lights and machines. 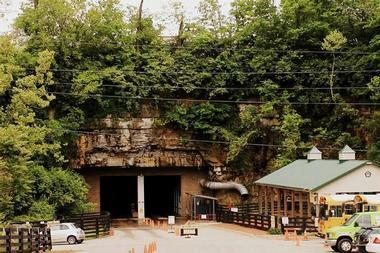 The Louisville Mega Cavern features an array of tourist attractions for visitors to enjoy. 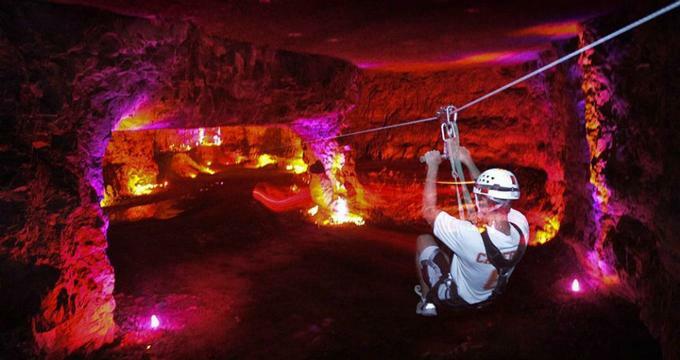 Mega Quest is one of only 20 aerial ropes challenge courses of its kind in the United States and the only fully underground course in the world. Hailed as the hottest new extreme sport in Europe, the course features an array of aerial challenges that can be climbed on, maneuvered over, and swung through. Mega Zips offers a thrilling and exhilarating adventure led by A.C.C.T. trained tour guides that take visitors into sections of the cavern never seen before and share their knowledge of the history and the geology of the man-made cavern. Mega Zips features six underground zip lines, including a two challenge bridges that will test balance, mettle, and skill, and a fun-filled dual racing zip that promises adrenaline-pumping and racing hearts. Mega Bike is a vast Underground Bike Park spanning over 320,000 square feet with more than 45 bike trails, including cross-country and single tracks, pump tracks, jump lines, BMX tracks and dual slalom. Designed by Joe Prise, the bike park’s tracks are multi-layered with a rough bottom, red sticky clay in the middle, and topped with grip turf. “Lights Under Louisville” is the world's only fully underground drive-through Christmas light show. Every holiday season, the Louisville Mega Cavern is transformed into an impressive, spectacular show of light with over 2 million lights and more than 850 brightly-lit characters. 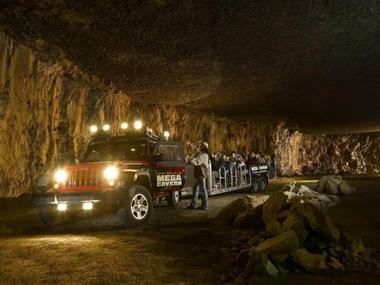 Visitors are allowed to drive their own vehicles through the Cavern during the Christmas season to experience this one-of-a-kind holiday transformation. The Louisville Mega Cavern is located at 1841 Taylor Avenue in Louisville and is open daily throughout the year with various operating times for each of the different attractions.